This is from an NTT Technical Review article ‘Development of SOFC Power Generation Module with High Electrical Generation Efficiency’ by Yoshiteru Yoshida, Katsuya Hayashi, and Masayuki Yokoo. 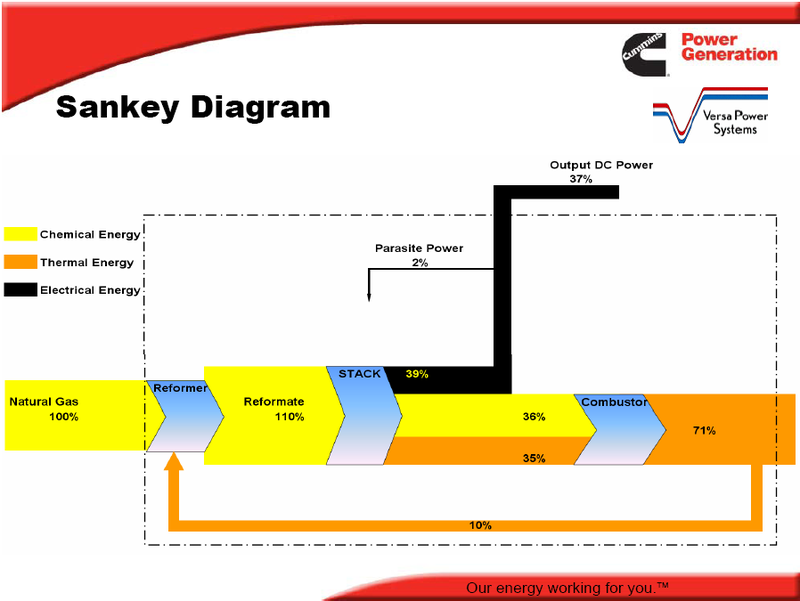 This Sankey diagram of the energy flows (values in kJ/s) is for the SOFC reference case. The wet and dry biomass flows are evaluated using lower heating values, higher heating value (HHV) basis in parentheses. 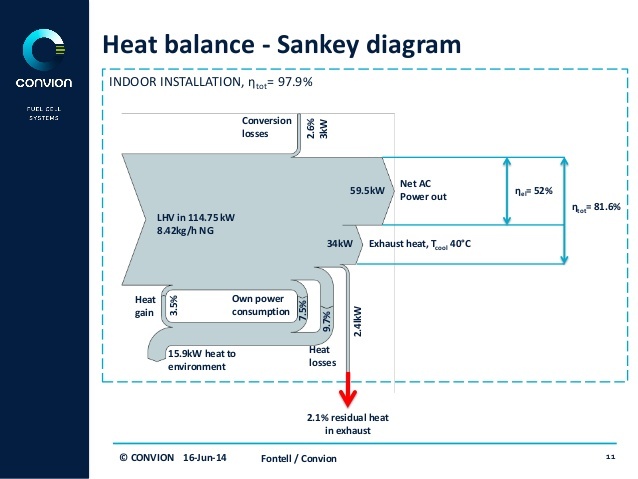 German Fraunhofer IKTS research institute features a Sankey diagram for a SOFC fuel cell system in this PowerPoint presentation (held 2012 at the Lucerne Fuel Cell Forum). Flows are in J/s, the power output has been converted to Watt. Some volume flows and parameters are given as additional information on the flows. As you are aware I am constantly looking for samples of Sankey diagrams, be they good, mediocre, or … fair. This 2009 report on fuel cell technology (‘Natural Gas – Fueled Distributed Generation Solid Oxide Fuel Cell Systems. Projection of Performance and Cost of Electricity’ prepared by J.Thijssen LLC for US Department of Energy, National Energy Technology Laboratory, and RDS under contract number 41817M2846) has two Sankey diagrams I would like to share with you. 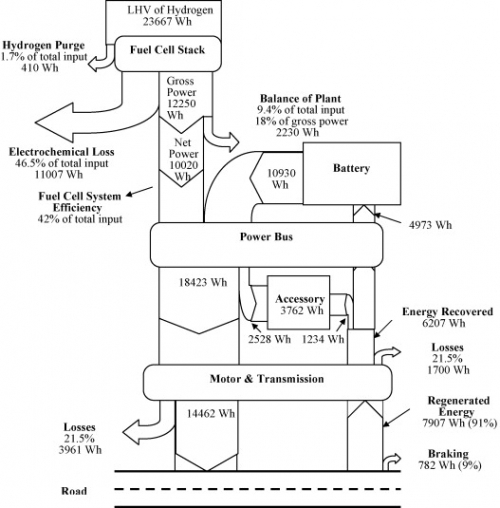 The report assesses energy efficiency, water use and CO2 emissions of the fuel cell system. I confess I am no expert in fuel cell technology (Wikipedia basics), and I assume the technology has evolved quite a bit over the last years. So I limit myself to a description of the Sankey diagrams presented. On page 9 figure 3-4 shows the energy balance “Sankey Diagram of the Baseline NG DG SOFC System” (NG = natural gas, DG = distributed generation, SOFC = solid oxide fuel cell). With an energy content of the natural gas input of 9.1 MW (based on the higher heating value) and an output of 5.2 MW electric energy the system has an efficiency of 57%. 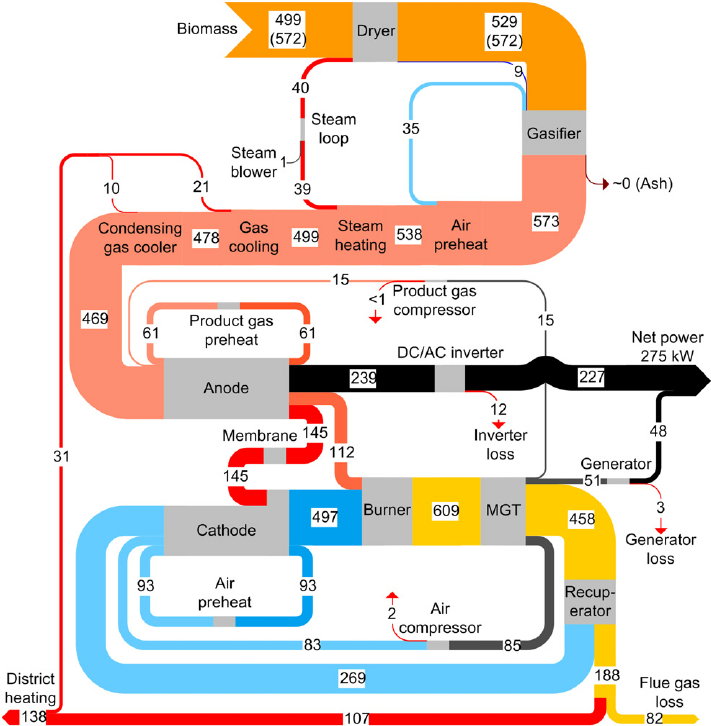 We can identify three loopbacks: syngas is recovered and fed back into the process, and heat is recovered “by thermal recuperation (by preheating the cathode air and raising and superheating steam) and chemical recuperation (by reforming part of the hydrocarbons, mainly methane, in the fuel)” (p. 8). These are the red arrows. Now here is what I don’t like about the Sankey diagram: While most of the arrows seem to be to scale, some aren’t. Losses branching out to the top are graphically exaggerated. The arrow representing thermal losses (2.5 MW) should be about half as wide as the one for 5.2 MW ‘Net Power AC’. The heavy spikes at the head of the arrow for inverter losses and energy used for CO2 compression overemphasize the comparatively small quantities of 0.2 MW and 0.3 MW (?!). The latter arrow seems to be labeled incorrectly (30 MW instead of 0.3 MW). In this diagram we are looking at water flow rates in kg/s. It seems as if most of the water is in a closed loop (0.52 kg/s) in the syngas recovery. The report on page 21 explains that “[w]hile the water demand for the NGDG system is considerable, net water use for the NGDG system is minor (only about 0.15 gal/kWh or 790 gal/day […]). The steam reformer has a steam demand more than 10 times this amount (about 0.55 kg/s)”. The label of the feed arrow at the top left has a wrong label and refers to 790 gal/hour(!). The magnitude (width of arrow) of the main loop representing a flow rate of 0.52 kg/s water in syngas recycle is not maintained especially in the curves. The main problem however is that it is not clear at which process step water comes in or flows out. I have come to the conclusion that the arrows for inflows (increase of arrow width) and outflows/losses (decrease of arrow width) are actually missing. So if you imagine an outward arrow to the label “0.12 kg/s water consumption at SMR” and two inward arrows from “0.44 kg/s water production in stack” and “0.06 kg/s water production in burner” the Sankey diagram starts to make sense. Will try to draw my own version of the Sankey diagram and present it here. Note that ‘SMR’ is for steam methane reforming, abbreviation not explained in the report. From a slideshow by Convion (Finland) on its fuel cell technology. Using a feed of 8,42 kg natural gas per hour with an energy content of 114,75 KW (based on the lower heating value) the CHP equipment yields 59,5 KW electric energy and heat. Biogas or hydrogen can also be used as fuel. Electrical efficiency is between 53 and 65% net AC, the total energy efficiency is larger 85%.